Over three years ago, I reported on a “Golden Glow Mystery” that was puzzling me. 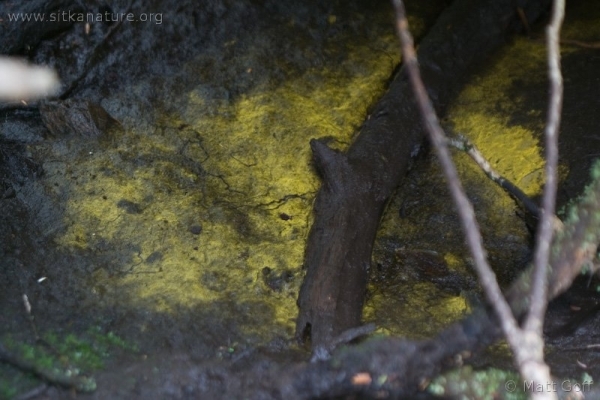 My brother and I had been hiking along Mosquito Cove Trail and I noticed a yellow something covering the surface of a muddy depression under a stump. First thinking it was pollen or spores, we determined that it was neither – as the intense golden yellow color was highly directional. That is, looking from some directions nothing was apparent on the surface at all even though from others, it took on the bright golden yellow appearance. I wrote up the post linked above and left it that, mostly not thinking much about it until recently. A little googling did not reveal much additional information, though I was able to find a few pictures and a page on Chromophyton at algaebase.org. Only one species is listed for the genus, but I wonder if that might be due more to a lack of taxonomic work in the group rather than a reflection of what’s out there in the world. I’m quite satisfied to have a plausible name for what I observed – especially after I read part of the description on Alagaebase page that states: “Because the chloroplasts are oriented uniformly in relation to the direction of the light, the water surface seen from a certain position will show a bright golden coloration” – the very characteristic that stood out as being so unusual to me at the time. On a related note, I find the way these answers came forward a rather fascinating process. Photographs taken nearly 30 years apart from Alaska and Africa, an e-mail list about (unrelated) bryophytes, and a response from Spain with commentary about the occurrence of the species in Japan all were vital links for me to get a solution to this mystery. I really appreciate the chance to make these connections that span the globe, and am grateful to those all those who contributed to this process. This entry was posted in flora, identification, Mystery and tagged Chromophyton, Golden Algae, identification. Bookmark the permalink. “Algae of light” – I really like that. What a superb find. Thanks – I thought the name was pretty evocative as well. I haven’t found it again since, but I’ll be keeping my eyes open.